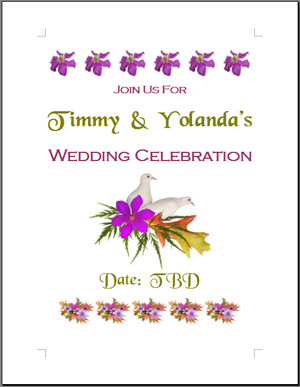 Create a flyer, layout a personalized menu or make a poster. Use our free clip art and Microsoft Word to get your message out. 2. Right click on the flower below and choose Copy. 3. Go back to your Word document. Right click and choose Paste. Your flower will appear. 4. Continue to Paste until you have the number of flowers you want for your top border. 5. Next, type your announcement or menu or any details you choose beneath your acorn border. Play with the font size or shape, the color, the layout – it's your creation, you decide! 6. 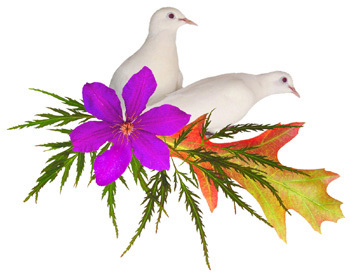 Right click on the doves below. Choose Copy. 7. Go back to your Word document. Position your cursor beneath your copy. Right click and choose Paste. Your doves will appear. 8. Beneath the doves, type in more detail about your event. Again, play around with color, size and layout. 9. Add a bottom border by clicking on the flowers below. Right click and choose Copy. 10. Go back to your Word document. Right click and choose Paste. Your flowers will appear. 11. Continue to Paste until you have the number of flowers you want for your bottom border. Review your work before you print. Go to “File” in the top tool bar and click on Print Preview. Check your work out, and then Print. It’s that easy to create a certain panache for your flyers, posters, menus, announcements and more. Design your own e-cards: E-cards are just as fun to make. Find out how.